Want to know what a PC case covered with $10,000 worth of carbon fibre looks like? 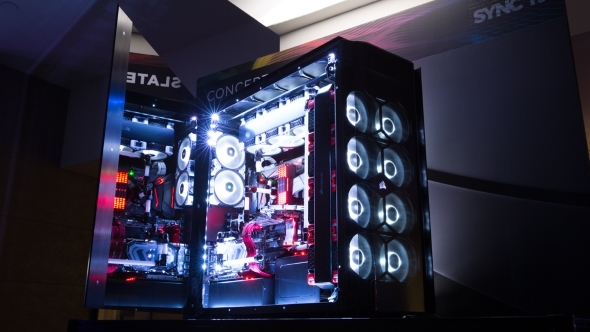 Corsair have set themselves up as the kings of concept products at Computex this year. 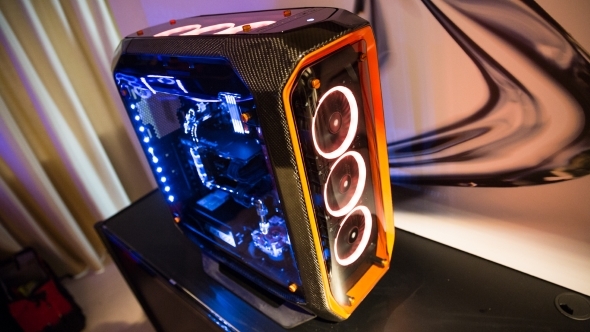 That’s pretty standard for a big PC trade show, where everyone is desperate to grab some attention but, with the exception of that hand-covered carbon fibre beauty up there, every other one of their concepts is coming this year. They’re not just into LEDs, Corsair are also responsible for our pick of the best gaming keyboards around. The Concept Curve is a reimagining of their beautiful Graphite 780T chassis and, for the show, they’ve had it finished with (actually over) $10,000 worth of carbon fibre. Y’know, to give it that supercar aesthetic everyone wants from their PC. It’s also finished with tempered glass on side and top panels, as well as a curved glass panel wrapping around the front of the case. 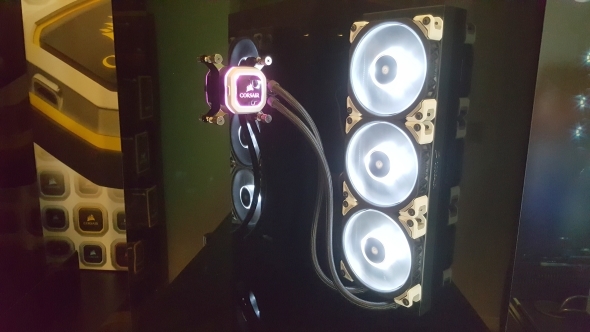 And, obviously, it’s covered in RGB LEDs, as is Corsair’s wont. Given the carbon fibre alone is worth more than a 4K HDR home cinema system it’s not much of a surprise to see the Concept Curve remaining solidly in the concept stage. But all the other concepts Corsair were showing off will find their way to market. Sticking with the chassis theme I was also introduced to the Concept Slate, a monstrously large PC case that’s designed to house system’s like the £24,000 8Pack OrionX PC from Overclockers. It’s got space for a hefty, multi-GPU, multi-socket high-end desktop rig, as well as space to drop a separate mini-ITX gaming PC into the cavernous space around its base. It’s got a huge amount of water-cooling potential, with space for multiple bespoke cooling loops and more fans than you have fingers and toes. Well, unless your mum and your sister are the same person, that is. Like the Curve it’s also clad in tempered glass, but because this is essentially a concept in name only, Corsair have really gone to town on the building experience as well. They’ve introduced racks on rails for the front and top cooling reservoirs, so you can slide them out to easily fit your cooler without having to get right inside the case. And there’s ample space inside to get your secondary mini-rig dropped in without too much contortion and french doors behind the motherboard tray to allow for total cable-tidying well away from the smoked, tempered glass vanity panels. They are though still finishing the finer points of the design, but for the most part this is what the final chassis will be like when it gets launched, we were told sometime around Q4. But if you have to ask the price, you can’t afford it. When they start talking about how some people are happy with Toyotas while others want Ferraris, you know it’s going to be expensive. Inside the Slate Corsair were also showing off their upcoming DIY water-cooling kits too. They will be releasing a full Corsair-branded solution so you can make your own bespoke loops… if you’re feeling brave. If not, they also had early concepts of their next-gen Hydro all-in-one liquid coolers on display too. They’re going to be offering 360mm versions of the new Hydros when they’re finalised and hit the market later this year, alongside their more-standard 120mm and 240mm versions. I was told that simply by replacing the old Hydro fans with the newer magnetic levitation variants they were able to get the chillers running cooler because of the extra air they were able to shift around. But by improving the pump and reservoirs too they’ve also been able to make the systems quieter up and down the RPM levels while also allowing them headroom enough to be able to lower the peak RPM they operate at. Quieter and yet still cooler? That’s most definitely a win. Corsair also had their Concept Zeus on display. 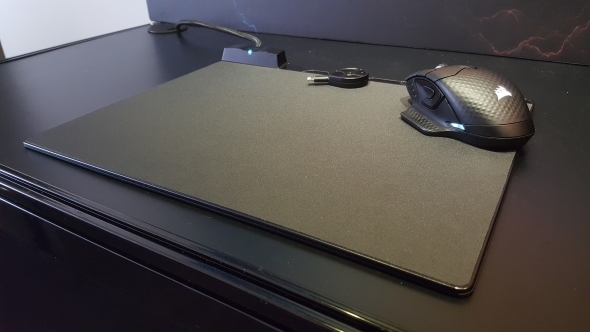 Now, before you get up in arms about a frickin’ mouse pad you have to plug into your PC, this mat has more than just LEDs up its sleeve. It comes paired with a wireless mouse and there’s a spot on the right hand side of the surface which will let you charge it up, sans cable. It uses a technology called Qi wireless charging (or inductive charging) and, because there are a good few mobile phones with the same tech, you can just leave your handset on that spot if you want to charge it instead. Again the Zeus is going to be released later this year and, like the Slate, it might have some slight changes to it when it does hit final production. Corsair said they may change the twin USB 3.0 cables to a single Type-C connector to power the mat and the USB pass-through which sits on the back. Corsair will also be bundling a little Qi charging dongle which will have both micro USB and Lightning connectors so you can still charge your iPhone or non-Qi phone. Outside of their concept products, Corsair had some other goodies to share, including their dust-proof, splash-proof K68 keyboard, overclocked X299 memory modules and a demo of their upcoming SYNC it software. Essentially SYNC it will replace Corsair’s LINK and CUE software, combining both the system/component and LED controlling applications into one neat package. They’re also working with motherboard vendors to be able to sync the whole PC too. At the moment they’ve just got MSI up and running, but are working with Gigabyte and others. Sadly Asus boards are unlikely to feature as they’ve got their own Aura LED goodness.